EXCELLENT VALUE Don't be fooled by the price! The Vino Luxe Premium Waiter's Corkscrew is not only exceptional in quality, but is also affordable, long-lasting and multi-functional. This corkscrew gracefully blends together the features of a wine corkscrew, bottle opener and foil cutter in a durable and tasteful manner. Made of fine STAINLESS STEEL with a comfortable wood grip handle, our corkscrew is durable, dependable and of superior quality! CAREFULLY DESIGNED WORM The strong stainless steel worm is guaranteed to remove any synthetic or natural cork easily and efficiently in only five turns. The precision-cut notches grasp the cork firmly and ease the drag as it cuts through the cork, effectively reducing the likelihood of crumbling. UNIQUE DOUBLE-HINGED FULCRUM With increased leverage provided by the innovative double-hinged fulcrum, even removing the longest cork is a cinch! The two pieced hinge makes wine opening twice as easy by offering a smooth, two-part removal that is superior to older-styled hinged devices. LONG, SERRATED & ROUNDED FOIL CUTTER Our professional grade design not only provides you with a clean, smooth cork removal, but also has a built in foil cutter that makes foil removal quick, easy and eliminates the need for any additional tools! The foil cutter has been specifically designed to minimize the risk of slippage and tearing of the foil. HIGH-QUALITY PRODUCT WITH A SATISFACTION GUARANTEE Our positive product reviews speak for themselves! 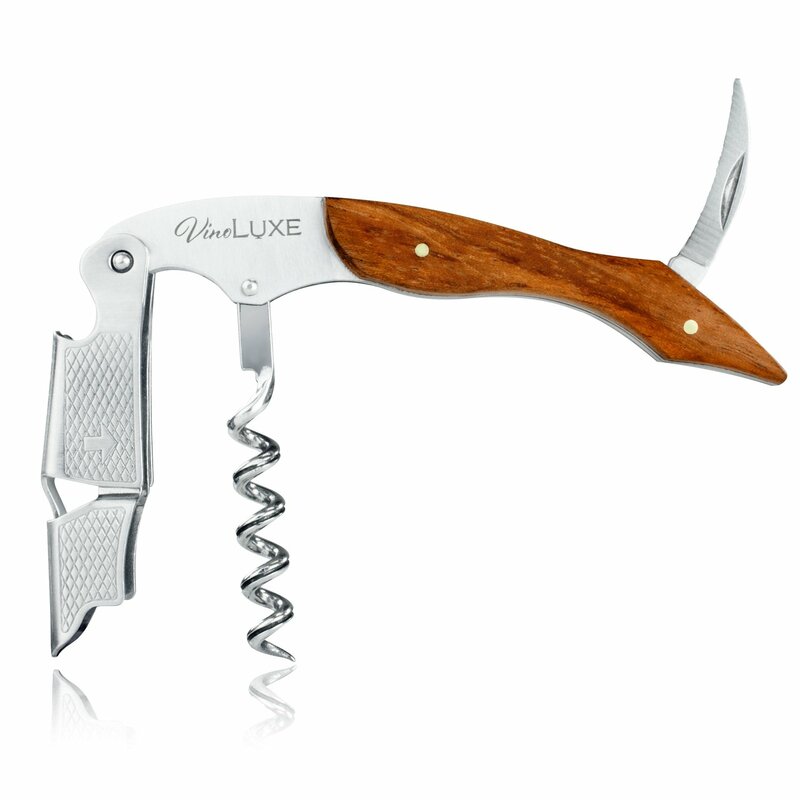 The Vino Luxe Premium Waiter's Corkscrew is top-notch! We are so confident in the quality of our product that we offer a 30-day satisfaction guarantee. If you are unsatisfied, simply contact us to return the product for a full refund. Calling all wine lovers! Uncork your favorite bottle of wine with ourmultifunctional Vino Luxe® Premium Waiter’s Corkscrew. It is an essential forany kitchen, wine cellar or wet bar! Offering style and durability at anextremely affordable price, this multifunctional tool will meet all yourneeds. Blending elegance with functionality, our sleek corkscrew will openbottles, cut foil and has a double hinged-fulcrum that allows you to simplyand smoothly remove any cork. Our uniquely designed worm ensures that yourcork won’t crumble or break off during removal, but will slide right outeffortlessly! With a stylish stainless steel body and an extremely comfortablewood handle, your experience will be satisfying. It also makes a great gift!Give the gift of Vino Luxe® for weddings, housewarming parties, andanniversaries. Anyone would be ecstatic to receive one. Don’t wait! Purchaseyours TODAY!